It was pretty cold this morning in the upper 30s and that was somewhat surprising with how hot it’s been by late morning. 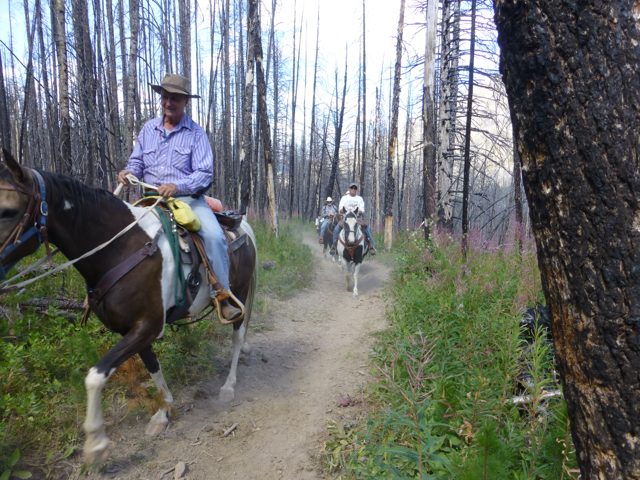 We were in a burned area and then a dark treed river valley, shaded from the sun all morning, so we kept our heavy jackets on most the morning. The goal was to get to our next resupply location, Benchmark Ranch. Benchmark is a remote ranch just 1.5mi from the trail where hikers can send their resupplies, but it’s not like a town, so you only get what you send yourself and it’s quite a process to send a box. Sometimes there are showers or cabins available, but today no one was at the ranch. The owners are very supportive of CDT hikers and had a large bear proof storage container on the porch with all our boxes in it. It was really full and they left a note saying they’d have to get a second large storage container for the hikers next year since there are so many more hikers doing the CDT. There was an alternate route that went closer to the ranch that paralleled the official route and used to be the CDT, so we took that. 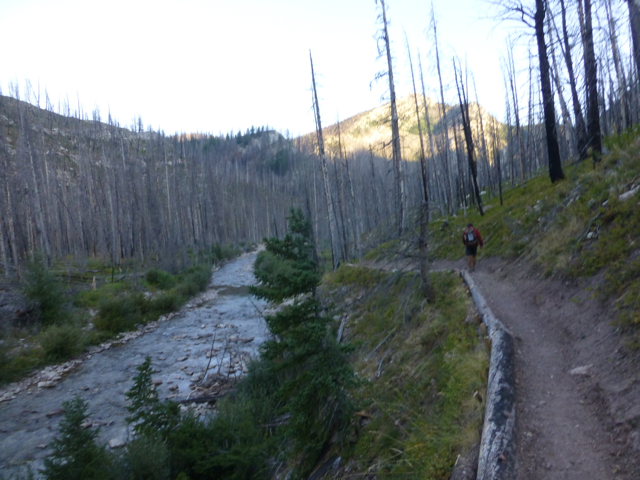 We got there around 10:30am and were lucky to hitch a ride both there and back from the trailhead saving us the 3mi round trip of hiking the extra non trail miles on a hot sunny gravel road. It was great there! Even though no one was there, we were still able to hang out in the main entrance area where it was shaded with all the hikers boxes, picnic tables, bathrooms, water, and comfy rocking chairs. We first got our food organized for the next leg. It’s a long leg, so we each have five nights and six days worth of food. The ranch requires a certain sized box of 1ftx1ft max and it’s a $25/per box fee for handling since it is such a remote place. With how much food northbounders are eating by this time, many have to send two boxes just to fit all the food they need. Sadly, two hikers ahead of us either had a mailing mishap or stolen box. Beacon and Optimist and Stopwatch arrived to no boxes and had to get hitches to the closest town to resupply. That would be such a bummer. These things rarely happen in the hiker community as it’s common for all our boxes to be piled up in a public location. I hope it was an isolated incident and not a reoccurring problem because there are a lot of boxes in there for the hikers behind us. Here is the pile Bloodbath and Rampage had when they dumped it all on the table. They were most excited because they also sent themselves some Chef Boyardee Ravioli and boxed wine as a special treat to have at the ranch before we left. They had forgotten what resupply it was in and hoped it was in various boxes ever since New Mexico. It ended up being in their final box. They were pretty excited! Rampage said she got upset when it was bought before the trail saying she’d never eat ravioli out of a can. 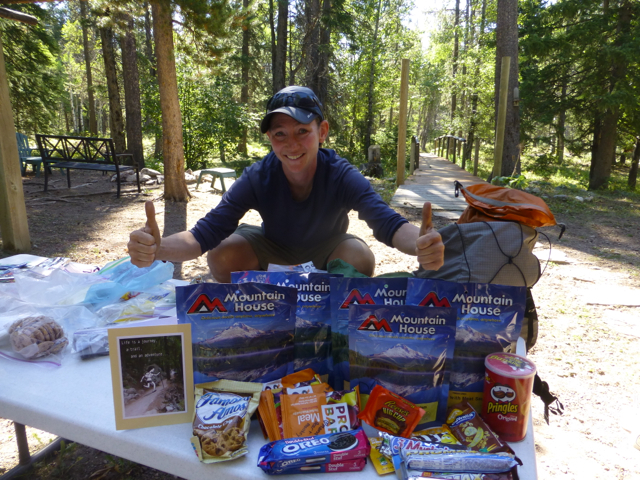 Just to show what the trail does to your hunger, she said she’s been dreaming of it for the past five days, ha! I got plenty of food and even ate a ton while at the ranch. I really can’t believe how much I’m eating! I want to thank everyone who sent things that were in this box. THANKS to Steph, Katy, Chad, Claudio, Val, Edie, George, Heart, Dan, Mama Bear, Monkey, and Yankee! 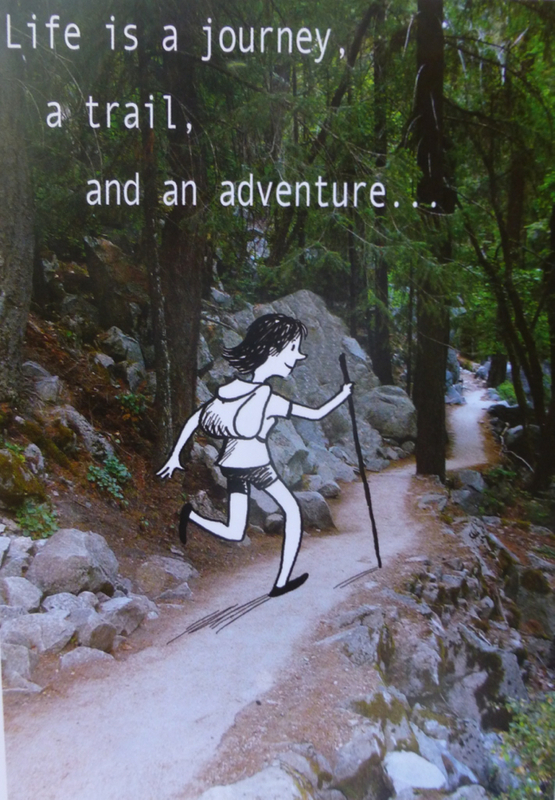 Steph even sent this perfect card that I just LOVE! I like it so much that I’m carrying it all leg until I get to my bounce box in six days so I can send it home to hang up. Thanks Steph! While we were at the ranch, southbound section hiking couple arrived named Mouth Gravy and Elk Man. They were really great to talk to! 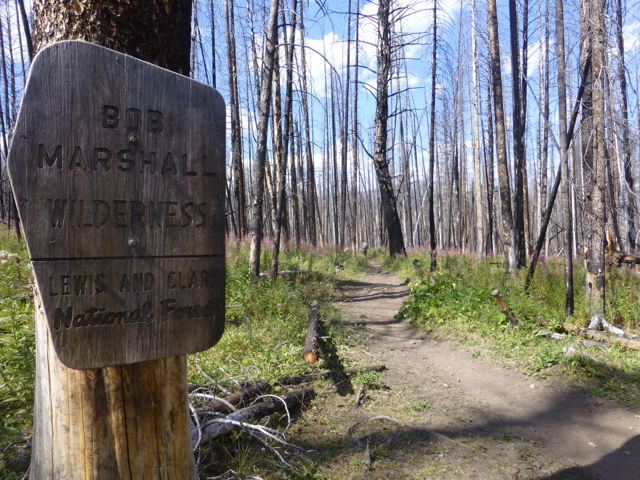 The unfortunate news that they gave us is that just two days ago, the fire reroute we have coming in the Bob Marshall Wilderness (aka “The Bob”) was just expanded to cut off even more of the official route. It now makes it so that we won’t be able to see the biggest attraction through the Bob, which is the Chinese Wall and most of our hiking will be down low and wooded without views. I’ve been looking forward to seeing the Chinese Wall all hike and it’s definitely a highlight of the trail as it’s a large rock formation that we would have walked along for more than a day. I recommend that you look it up online and pretend I hiked that section. It’s a real bummer, but nothing we can do to change it. The fire reroute has been there most of the summer and apparently, it just expanded. It appears to cut off about 60mi of the official route. 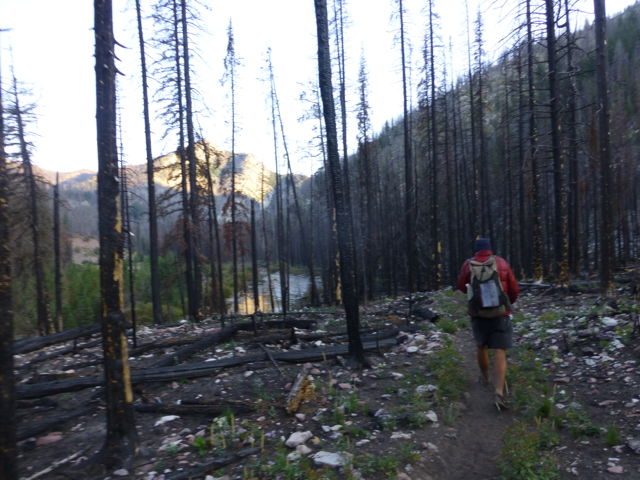 One positive is that the reroute around the fire makes it possible to still hike in the Bob and the mileage seems comparable to what we would have hiked anyway. 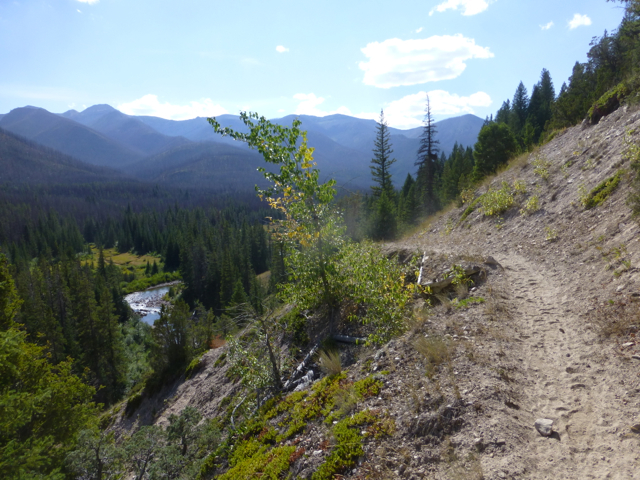 One negative Mouth Gravy and Elk Man warned us about is that the trail is mostly on very dusty horse trails. When we get to E Glacier, we will have gone 10 days without shower or laundry. We will be pretty filthy. We already are! Yesterday was hazy, but we were lucky with winds blowing the other direction today, so our views were much clearer! It was really hot, exposed, and uphill after we left Benchmark. I had mistakenly had lots of heavy food sent to myself, so my pack felt way too heavy. I immediately started eating all the heaviest food and I’m sure it will feel better tomorrow. Rampage and I listened to more of the audiobook, Flight Behavior by Barbara Kingsolver and are hoping it improves. There are signs posted everywhere and we are camped right at the intersection for the start of the two day reroute. I’ll talk more about the reroute tomorrow, but here’s an example of the signage. 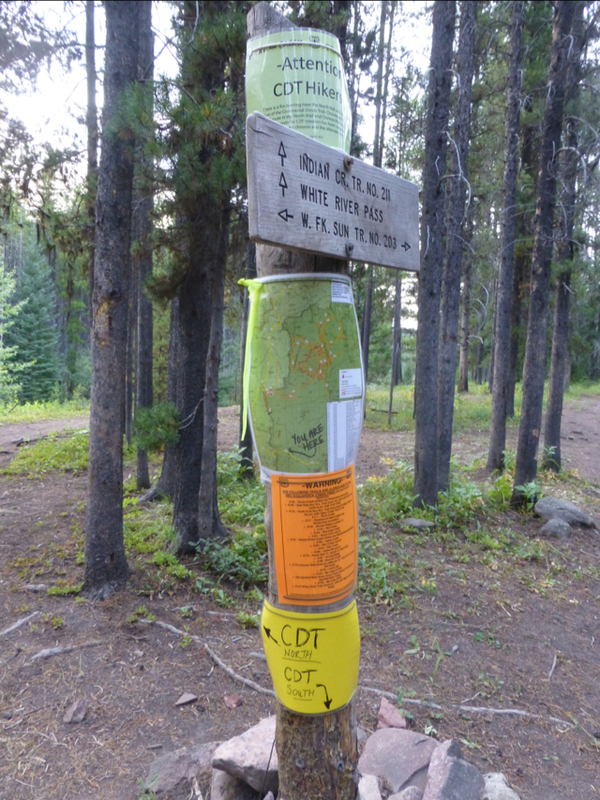 They have done an excellent job of paying extra attention to CDT hikers. There isn’t any confusion on which way to go, so that’s really great. We are set for mileage, so we got to stop over an hour early at 6:15pm. It was great! 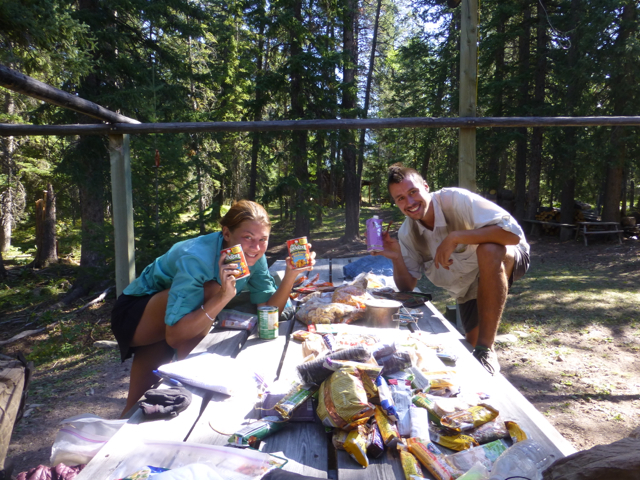 We are back with the bears, so we were sure to eat away from camp and hang anything scented. 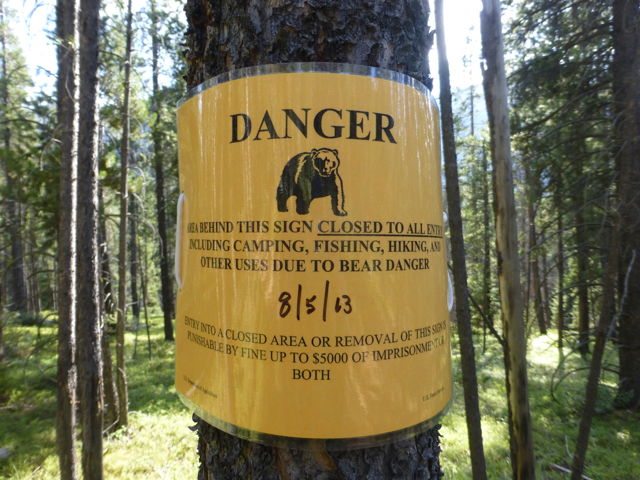 Earlier in the day, there were signs of a closed camping area that has been frequented by bears. I’m looking forward to sleeping in tomorrow morning. We are looking to average 27.5mi/day over the next four days and that is really going to be enjoyable. It gives us about two hours less of hiking each day, so it will be great to sleep in, hike a relaxed pace, have an extended lunch, and finish early if all goes according to plan. The days have been getting shorter and my body has been wanting shorter days, so this will be perfect!